Dr. Sidle has a particular interest in hair loss and hair restoration. This stems, in part, from the intensive year of study spent under the guidance of Sheldon Kabaker, M.D., a world famous hair transplant surgeon. Male pattern baldness (androgenetic alopecia) occurs as the result of shortening of the hair growth cycle gradually shortens. This causes subsequent growing hairs to become miniaturized. As the population of these miniaturized hairs gets greater while the population of your prior thick hairs gets smaller, your hair becomes noticeably thin. This process is influenced by the hormone dihydrotestosterone (DHT). DHT is the biochemical culprit that causes male pattern hair loss (androgenetic alopecia) in those genetically predisposed to having it. This condition ordinarily is progressive throughout the adult life of the predisposed individual. Many changes and improvements have occurred in the way we can maintain and restore hair for balding in both men and women. Hair transplants are much improved – no more of the “doll’s hair” or “corn row” appearance that were seen in the past. Special techniques and magnification are used to create hair grafts of the smallest possible size that still retains the natural characteristics of hair growth. In recent years great change has occurred in the way many surgeons perform hair transplants. Our clinic and others have adopted the use of the dissecting microscope to create hair grafts of the smallest possible size that still retains the natural characteristics of hair growth. By natural characteristics of hair growth, we mean the pattern of hair follicles as they grow out from the skin. If one looks at the scalp with 5-10 powers of magnification, it can be seen that hairs grow out of the skin in clumps of one, two, three, and four hairs. The human scalp averages one follicular unit per 1mmï¿½ and each unit averages 2.2 hairs. Therefore a strip of scalp 1cm in width and 10cm in length could yield 1000 follicular unit grafts (2200 hairs). This is the way nature grows hair, and the closest we can come surgically is to move hair in these follicular units in their natural groups, cutting away the non-hair-bearing skin between them, and then transplanting them into tiny slits on the top of the head. With certain situations, only two or three graft sessions are necessary to give complete results and, if the goals are limited, sometimes one session may suffice. By keeping hair transplants as small as possible, yet keeping the follicular units intact, one can create a natural-looking appearance. It should be understood, though, that the density will fall short of the normal, pre-bald hair covering. In performing large sessions of hair transplants, it is necessary to have a team of physicians, nurses, and technicians who can do the labor-intensive tasks of cutting the donor hair under microscopes into thousands of these small grafts and then inserting them into the punctures that the surgeon makes into the scalp. In our clinic, we have up to five assistants working a case, often alternating assistants to lessen the fatigue factor. The skill and experience of these assistants is crucial to efficient and successful modern-day hair grafting. Many clinics perform these procedures under local anesthesia only. This allows the patient to be fully alert through the procedure and be able to drive himself home afterwards. In our clinic, we offer oral or even IV sedation to patients so they may be sleepy or unaware through a good part of the procedure. If they do wish to drive themselves or take public transportation without assistance, we offer local anesthesia alone. With either scenario, the operation is painless once the scalp is anesthetized. If sedation is used, the 3-7 hr. period of work can be but a vague memory. Postoperatively, we often put a dressing on the back of the head to collect any drainage. The first night, this is removed. Often we do not put a dressing on the top of the head; however, you may be instructed to place moist dressings on the scalp which are changed every 2-3 hours. This technique seems to lessen the amount of crusting and sometimes causes the hair to grow a bit more rapidly. Alternatively, you may be instructed to spray your new grafts to keep them moist. Most patients can wash their hair gently two days after surgery. The second day after surgery, they can gently shampoo and, on the third day, they may use their usual hairstyling methods. The stitches or staples used for closure in the back of the head are removed in ten to fourteen days. A few problems and complications occur with this hair transplant procedure. The most frequently seen problems relate to swelling of the forehead, which can occur within the first week after surgery, and small pimples that may form at some of the graft sites during the first three or four months after the procedure. The swelling, if it occurs, goes away spontaneously. We employ certain measures during surgery to lessen the incidence of swelling to where we see this phenomenon in perhaps one out of eight cases. The pimples or cysts that form are treated by simply opening them, if they occur. We have the patients return for inspection to be sure that these potential problems are addressed early. Very rarely, wound infection may occur which is treated with antibiotics. A common occurrence after large sessions of grafts is temporary fall-out from previous grafts or from some of the thinning, balding hair. Because of changes in circulation that occur from the many puncture points in the scalp, some hairs are shocked. By “shocked”, we mean that the blood supply is temporarily diminished, causing the hair to go through a premature hair-growth cycle where the hair falls out and re-grows again. If this happens, do not be alarmed. The previously transplanted hairs will all grow back, along with the newly transplanted hairs. It should be emphasized that hairs, when they are transplanted, take an average of three months before new growth appears above the surface of the skin, with some taking as long as nine months. Little crusts and hairs that are in the grafts when they are put in place, fall out within the first three weeks, but this and the shedding of other hairs is no cause for concern. In the “old days” hair grafting was done with the larger grafts, which have pretty much been abandoned for the smaller grafts described in this writing. These older style grafts, often referred to as “plugs”, often resulted in the “corn row” or “doll’s hair” look. This was due to large grafts standing out by themselves. By dividing the donor source into smaller grafts, we spread the hair around more diffusely and, therefore, get a more natural look. We try to prevent an appearance that looks either like a doll’s hair or a wall of dense hair. In our clinic, we use the state of the art Follicular Unit Transplantation technique. Judgment, experience, and certainly a sense of artistry are required by the directing surgeon in order to get the optimal result with a particular patient. There is a great variety of balding patterns, hair textures, densities, colors, and scalp laxity, all of which are factors that involve certain modifications in an individual plan to get the optimal result. I emphasize that hair transplantation is not an assembly-line type of procedure where you can recommend the same technique for all people. I do not employ a counselor in my practice as I feel that it is the task of the surgeon himself to counsel the patient and to devise a plan based on his own professional perception. Propecia® (finasteride 1mg) is an oral medication prescribed to treat male pattern hair loss. It inhibits an enzyme that converts the hormone testosterone into dihydrotestosterone (DHT). DHT is the biochemical culprit that causes male pattern hair loss (androgenetic alopecia) in those genetically predisposed to having it. This condition ordinarily is progressive throughout the adult life of the predisposed individual. 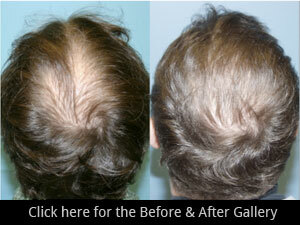 It is important to begin Propecia® therapy sooner rather than later. It is far easier to keep the hair on your head than it is to replace it after it’s lost. It takes about three months for it to begin to slow your hair loss rate down and a minimum of six months for me even to begin to notice regrowth. This is a long-term medication. It should be used for as long as you wish to keep your hair. According to long-term medical studies of people with male pattern baldness, 83% of those who consistently took Propecia® had no further baldness. This compares to 28% for those who took a placebo. Additionally, Propecia® was shown to regrow some hair in approximately 66 % of men who used it continuously. The side effects of Propecia® are very few and minimal. Decreased ejaculate volume (in 1.2% of subjects), decreased hardness of an erection (1.3%), and decreased libido (1.8%) are the only known side effects of this medication. These figures are only about a half of a percent more than with the subjects who were given placebo. In 58% of the patients who experienced a side effect but continued on with the medication, the side effect eventually disappeared. Also, 100% of patients who had a side effect and stopped the medication went back to normal. One Propecia® pill should be taken by mouth each day. It can be taken with or without food. Both Propecia® and Rogaine® slow down or stop the progression of male pattern baldness. There is evidence that, taken together, the two medications have a greater effect than either one alone. Also, if you are taking Rogaine® and want to take Propecia® instead, you should continue taking Rogaine® for the first six months after commencing to take Propecia®. Otherwise, there is a chance of having a sudden loss of hair.